An MIBG scintiscan is a type of imaging test. It uses a radioactive substance (called a tracer). A scanner finds or confirms the presence of pheochromocytoma and neuroblastoma. These are types of tumors that affect nerve tissue. A radioisotope (MIBG, iodine-131-meta-iodobenzylguanidine, or iodine-123-meta-iodobenzylguanidine) is injected into a vein. This compound attaches to specific tumor cells. You will have the scan later that day or the next day. For this part of the test, you lie on a table under the arm of the scanner. Your abdomen is scanned. You may need to return for repeated scans for 1 to 3 days. Each scan takes 1 to 2 hours. Before or during the test, you may be given an iodine mixture. This prevents your thyroid gland from absorbing too much of the radioisotope. You will need to sign an informed consent form. You will be asked to wear a hospital gown or loose-fitting clothes. You will need to remove jewelry or metal objects before each scan. Many drugs interfere with the test. Ask your health care provider which of your regular medicines you may need to stop taking before the test. You will feel a sharp needle prick when the material is injected. The table may be cold or hard. You must lie still during the scan. This test is done to help diagnose pheochromocytoma. It is done when an abdominal CT scan does not give a definite answer. It is also used to help diagnose neuroblastoma and can be used for carcinoid tumors. There are no signs of a tumor. There is some exposure to radiation from the radioisotope. The radiation from this radioisotope is higher than from many others. You may need to take extra precautions for a few days after the test. Your provider will tell you what actions to take. Before or during the test, you may be given an iodine solution. This will keep your thyroid gland from absorbing too much iodine. Usually people take potassium iodide for 1 day prior and 6 days after. This blocks the thyroid from taking up the MIBG. This test should NOT be done on pregnant women. The radiation can pose danger to the unborn baby. Bleeker G, Tytgat GA, Adam JA, et al. 123I-MIBG scintigraphy and 18F-FDG-PET imaging for diagnosing neuroblastoma. Cochrane Database Syst Rev. 2015;(9):CDC009263. PMID: 26417712 www.ncbi.nlm.nih.gov/pubmed/26417712. Patel D, Nilubol N, Kebebew E. The management of pheochromocytoma. In: Cameron JL, Cameron AM, eds. Current Surgical Therapy. 12th ed. Philadelphia, PA: Elsevier; 2017:760-767. 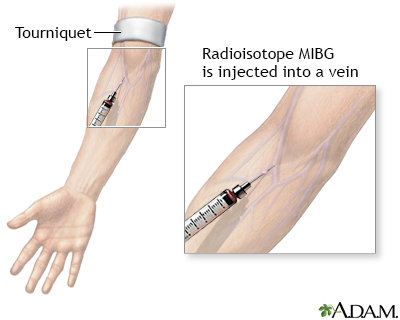 During a MIBG scintiscan, the radioisotope MIBG is injected into a vein and then the abdomen is scanned. The scanner detects radiation from the radioisotope, MIBG, in order to locate or confirm pheochromocytoma, an adrenal gland tumor.